Overall change in writing scores for Big History Project students. 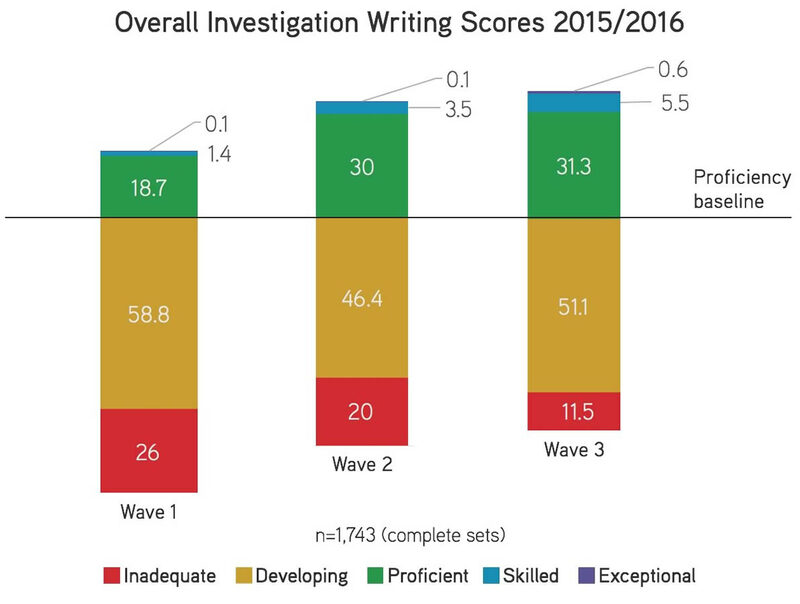 Our belief is that the key to the gains in writing skills we’ve seen in BHP students is simple and a little obvious. To get better at writing, students need to write often and have a clear, consistent set of guidelines for what makes good writing. To this end, we’ve been using the same rubric in our research study for years. It has been reviewed, refined, and updated to the point where it’s pretty solid. We know that many of you have your own writing rubrics, and that’s totally OK with us. If you don’t have one, or you’re just curious to see ours, we’re happy to share the BHP Writing Rubric. Structure of the argument: Looking at the clarity of the paper’s position on the issue, how the paper uses supporting claims to reason toward a conclusion. Support for the claims: Looking for the ways the paper supports the various claims and uses the available documents as grounds and warrant/reason for the claims. Application of relevant concepts: Looking to see how the paper goes beyond the documents given to anchor the argument in relevant foundational concepts (such as collective learning or claim testing) or core concepts (such as evolution or modern age). Use of appropriate mechanics: Looking at whether or not the paper uses appropriate mechanics for academic writing. How do we actually apply the rubric? Bob Bain of the University of Michigan wrote up our approach in a paper that includes snippets of student submissions and a description of how each was scored and why. This is a pretty lengthy document because it’s intended to give you a detailed picture of the differences among the scores for each category of the rubric. Read the paper—or at least take a look—and you’ll get a clear picture of what, for example, a grade of 1 in the Support for the Claims category looks like, compared to a grade of 5. You’ll find Bob’s paper here. We know there’s a good chance you’ll disagree with us on at least a point or two. That’s to be expected and we look forward to the conversation. Our primary aim is to be really clear about what how we are applying the rubric so that you can then adapt BHP Score to meet the needs of your own students. Watch the video below to learn more about the BHP Score enrollment process. To register to teach BHP, click here. If you’re a registered BHP teacher and ready to enroll in BHP Score right now, click here.